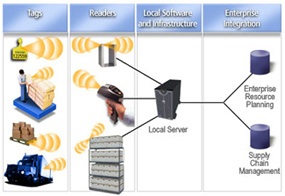 Radio-frequency identification ( RFID ) is an automatic identification method, relying on storing and remotely retrieving data using devices called RFID tags or transponders . An RFID tag is an object that can be applied to or incorporated into a product, animal, or person for the purpose of identification using radiowaves. Some tags can be read from several meters away and beyond the line of sight of the reader. Most RFID tags contain at least two parts. One is an integrated circuit for storing and processing information, modulating and demodulating a (RF) signal and can also be used for other specialized functions. The second is an antenna for receiving and transmitting the signal. A technology called chipless RFID allows for discrete identification of tags without an integrated circuit, thereby allowing tags to be printed directly onto assets at lower cost than traditional tags.